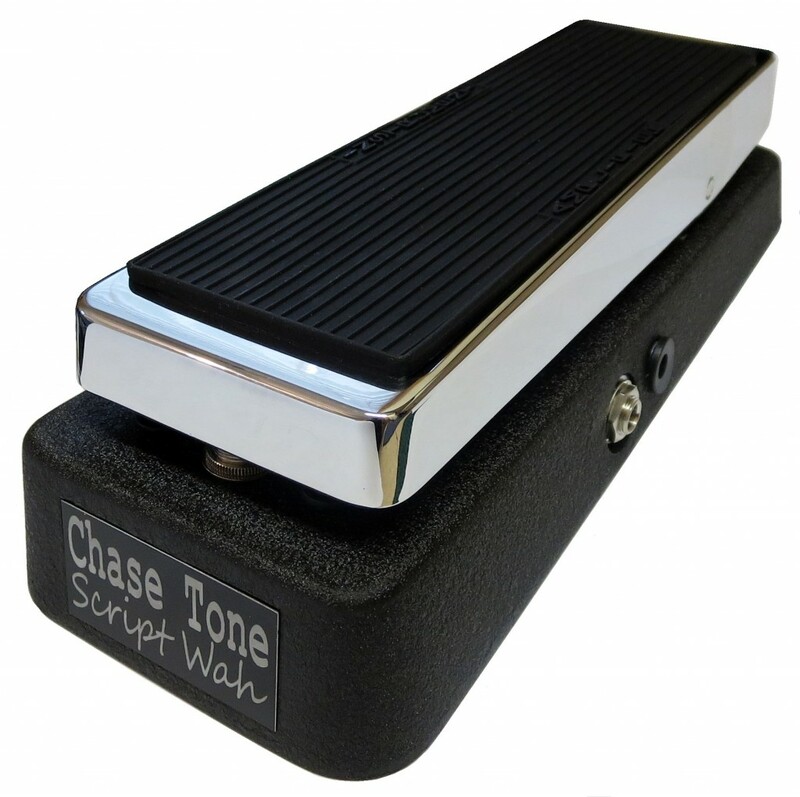 The Script Wah has been replaced by the Chase Tone Scripture Wah- Check it out! 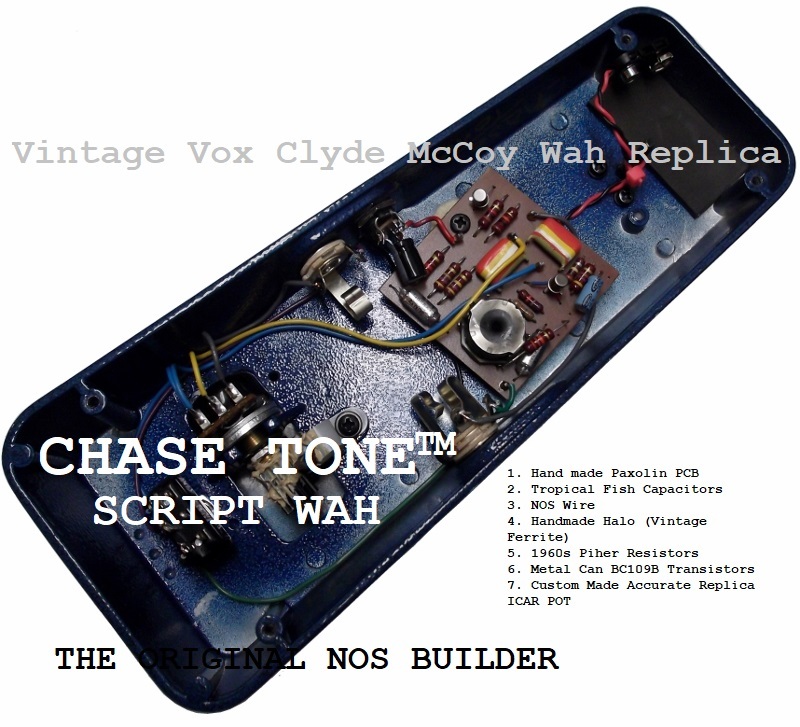 Fine-tuned replica of the mid-late 1960s highly sought after Vox Clyde McCoy Script Wah. The unique and recognizable curved sweep offers a smooth, wet sound and thus operating the pedal in a rapid motion offers Univibe like pulsating tones very easily. 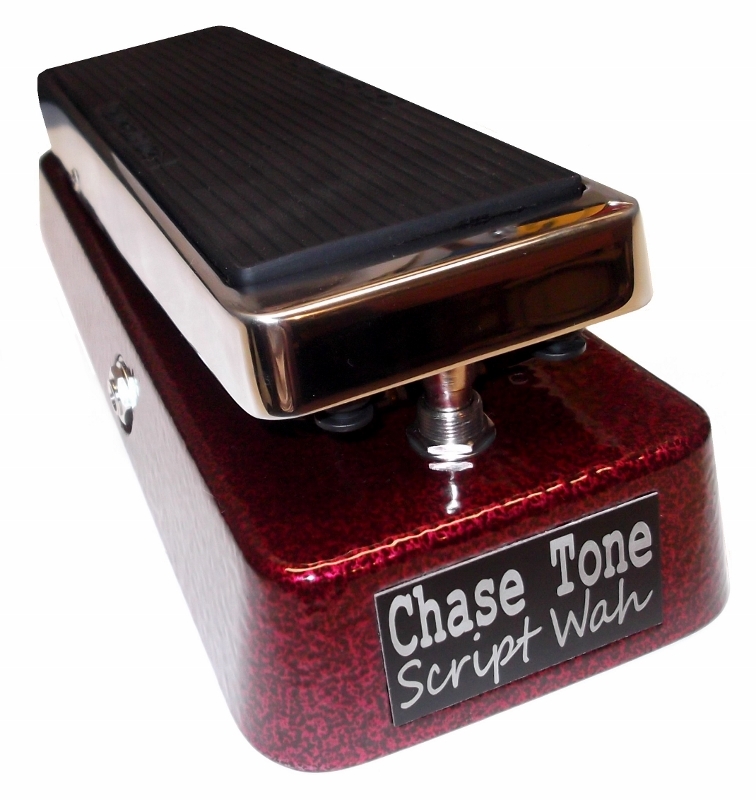 The Chase Tone Script Wah Replica can be further custom tuned to be even more reminiscent of the quick and fast ‘midnight lamp’ muted trumpet wah wah sounds – including the elusive ‘White Room Studio’. Please check out the sound samples below! Closet Classic Finish: Authentic 1960s Vox Black Texture Powder Coat Finish with Hexavalent Hot-Rod Show-Room Chrome Rocker Top! $410 Closet Classic Vintage Black Texture & Hexvalent Hot Rod Chrome Rocker. WOW!… The Wah arrived yesterday and sounds incredible. The tone and feel of the mid-range in particular is exactly what I’ve been trying to find for a very long time. I can’t thank you enough for the extra effort you put into communicating all the options and the fine tuning you did on this Wah for me. I’ve always thought a Wah could sound like this but you’re the first person i’ve found to nail it, I can’t wait to take this into the studio next week. 1966 JTM45/100 Replica w/ Angled Pinstripe Replica Cabinet & 30 watt speakers. 1968 Fender Stratocaster Replica w/reverse staggered pickups, reverse angled bridge pickup, and reverse neck featuring tone control modification to bridge single coil pickup. Neck pickup is used in sound clip. Korg Digital Recorder- Reverb added for ambience. Mic’d 10” (inches) away from center cone. 1966 JTM45/100 Replica w/ Tall Pinstripe Replica Cabinet & 30 watt speakers. Korg Digital Recorder- Reverb added for ambience. Mic’d 12” (inches) away from center cone.